Leandro Sbrega and Nina Colasimone were married in 1924, arriving in Capreol shortly after. Leandro opened a gas station in 1925 under the British American franchise. 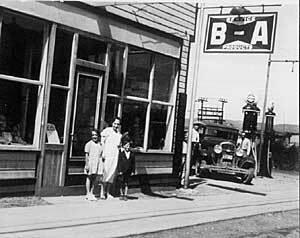 In 1928 the gas station was closed and converted into a new business called Sbrega's Ladies and Children's Wear. Nina who was born in Italy, ran Sbrega's clothing store for over 50 years. Nina was one of the founding members of the Daughters of Isabella in 1954 also serving as their Outer Guard for many years. Leandro and Nina had four children Henry, Virgina, Armand and Frances. Armand married Delphine Mazzuca and they have three children Gina, Larry and Tommy. Delphine purchased Sbrega's Ladies Wear from her mother-in-law Nina and continued to operate the store until 2000. Armand owned and operated another business, Sbrega's Men's Wear, for over 32 years. Armand is an active member of the Royal Canadian Legion, Branch 179 in Capreol. If you go to the Legion on Fridays, you will see Armand in the kitchen helping with the weekly fish fry. Bowling is another one of Armand's passions. Armand bowls in several leagues at Capreol Bowl and he is one of the top bowlers in Capreol.